The Escape has two rooms to choose from. Their most well-known is From Prison (which is reviewed here). 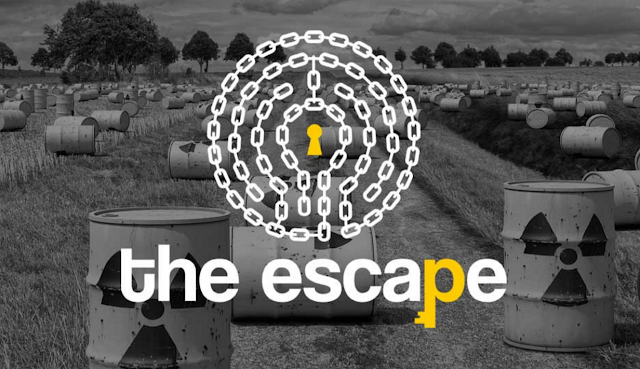 Their other room is called From the Container and the theme is a little less of a standard go-to story to base an escape room around, rather than a jailbreak. You play as journalists who have been researching a story on dangerous chemicals that are being dumped in the water supply. You’re hot on the trail of the company responsible, when you’re found out and now need to escape from the container that you’re being held in. It’s no longer about publishing your exposé, and more about surviving. Both of The Escape’s rooms begin with everyone in the team locked in handcuffs. This does mean that you’re made to sign a hefty disclaimer beforehand, but it’s not anything to be concerned about. Your hands are cuffed in front of you rather than behind your back, so you have an almost full range of movement, and you’re able to release yourself very quickly in the game. So while it’s fine in practice, the only problem I had with it was that it was never really explained in terms of the plot why you were in handcuffs in the first place. This hole in the plot has actually been explained since we played the game. At the time that we booked, the game was known as From the Safehouse, and the team of journalists were hiding in a safehouse while investigating the story. Since then, the game has been renamed to From the Container (it’s only a name change, there are no changes to the puzzles). The story has been expanded to explain that the journalists have been abducted by the corrupt corporation responsible for the pollution of the water supply, and need to escape the container where they’re being held. Not only does this explain the handcuffs, it also makes a lot more sense in terms of the decoration of the room and the props that can be found there. When the game starts, you’re left handcuffed in what feels like the inside of a shipping container. At first glance, it doesn’t look like there’s anything to be found, but there’s quite a bit to uncover and you get to use some rather fun toys in the process. This first section of the game was my favourite part, finding surprises built into the set that didn’t appear to be there at first. The room design was very clever, and sometimes so clever that it was easy to overthink the more straightforward puzzles. It must be some kind of code! The room could benefit from making pen and paper available in the later part of the game, as there’s a puzzle where it would be useful. It wouldn’t make sense to be able to take stationary supplies in with you, seeing as you’re handcuffed on entry, but then you are supposed to be journalists and it wouldn’t be too difficult to plant a pile of your confiscated belongings to find later on. Although there is the one puzzle where pen and paper would be handy to be able to work out the answer, this is actually the less difficult of the two rooms run by The Escape. This one would be better if you are a less experienced or smaller-sized team. It does mean that the room would work out as more expensive if you’re playing as part of a smaller team, as this room is priced with a flat fee rather than varying with the team size. As they’re being compared, though, this room feels the more polished of the two overall, and with the more clever design. However, both are worth a visit and some of the better rooms and well-run companies that we encountered in Zurich.